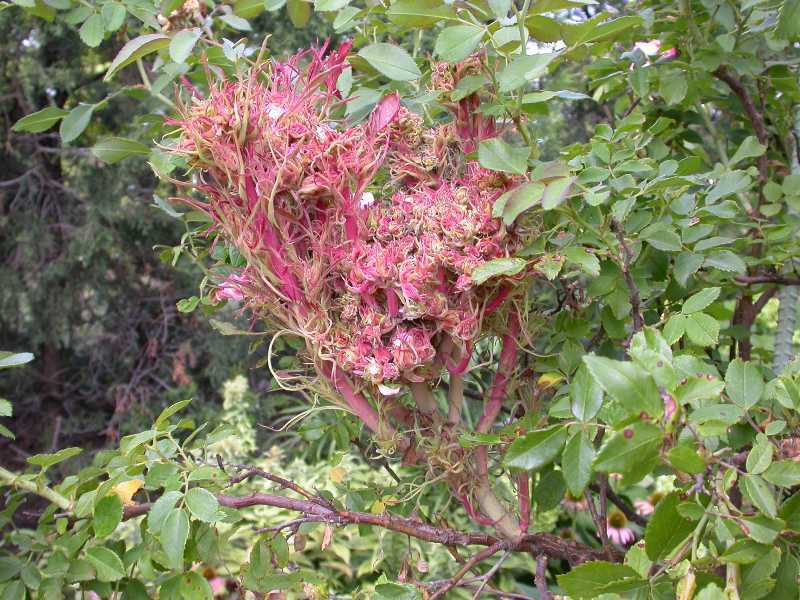 Rose rosette disease, also known as witches’-broom of rose, is caused by a virus (Emaravirus sp.) that is spread by a very small, eriophyid mite. 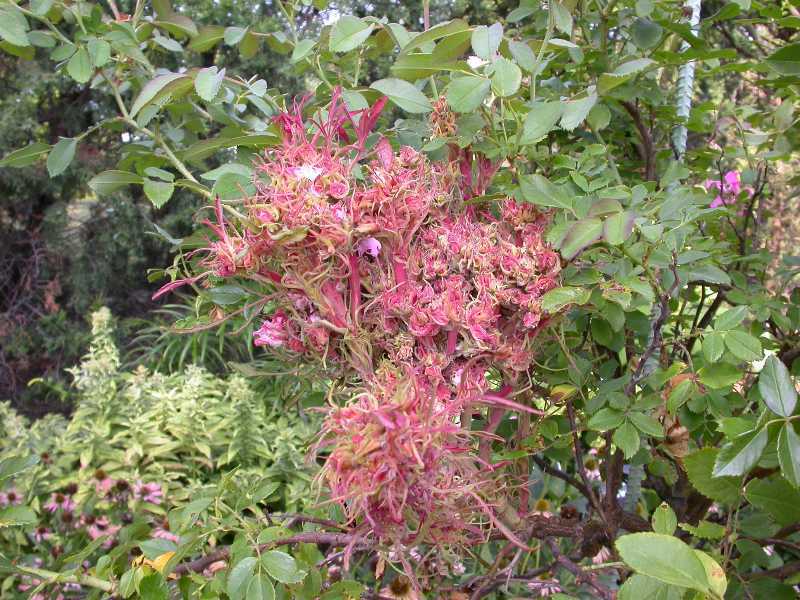 The disease is limited to plants in the genus Rosa but R. setigera, R. aricularis, R. arkansana, R. blanda, R. palustris, R. carolina and R. spinosissima are believed to be resistant. Its main host is the multiflora rose, which is considered a noxious weed throughout much of the United States. 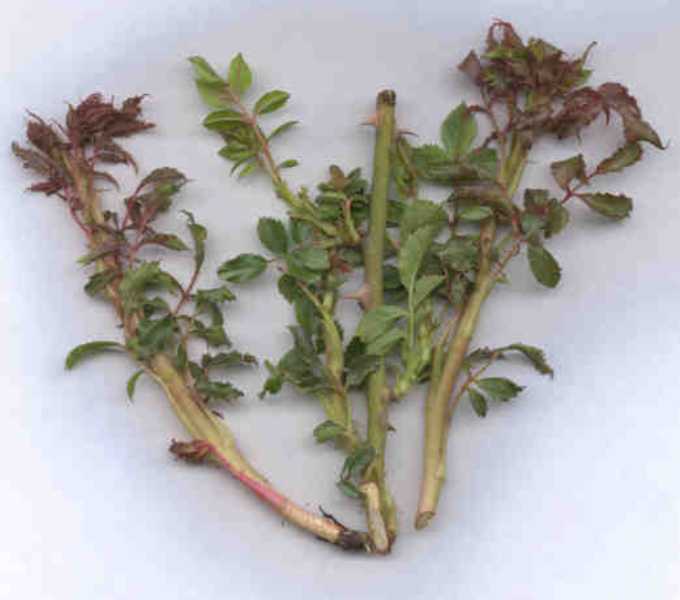 Interest in rose rosette has been generated by the threat to garden roses and its possible use as a biocontrol for multiflora rose. 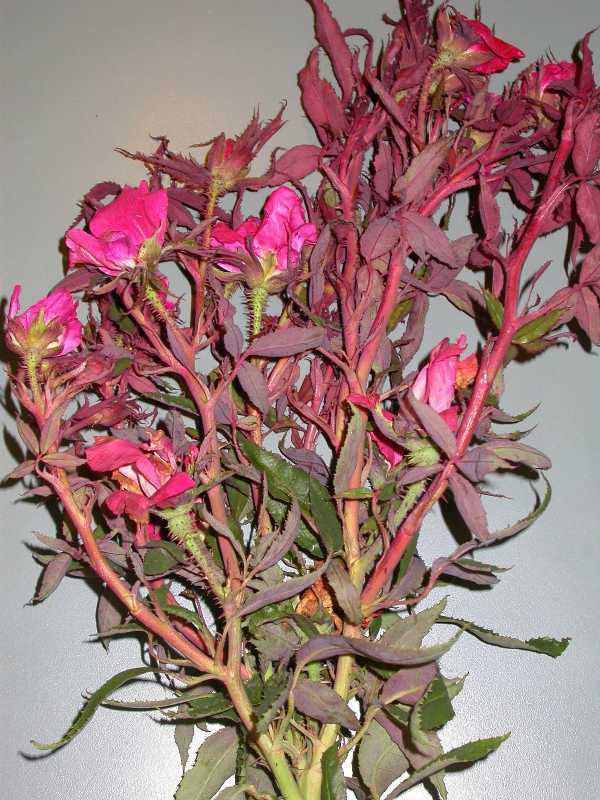 The earliest symptoms of rose rosette disease include a red pigmentation of the underside of leaf veins followed by sharply increased growth of vegetative shoots, which are typically more succulent than normal and colored in various shades of red. Leaves often become deformed, crinkled, and brittle with yellow mosaics and red pigmentation. 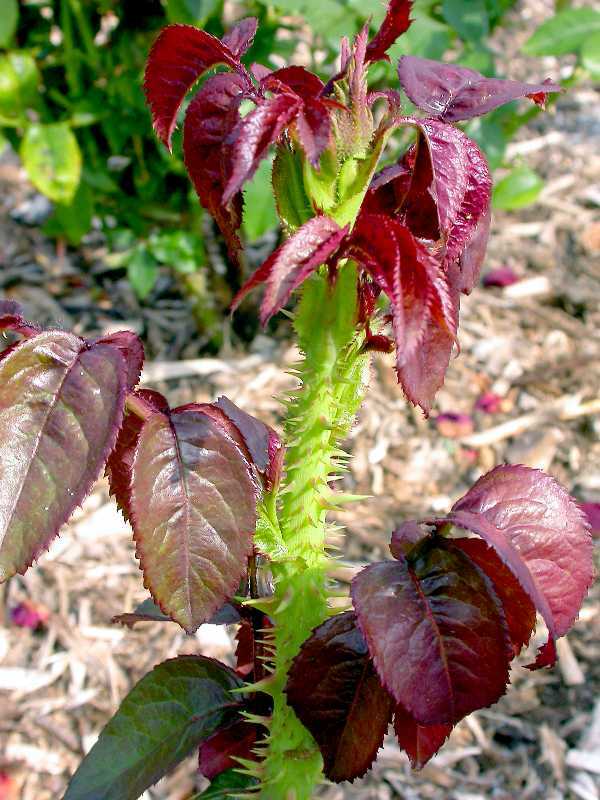 As the disease progresses, leaves become very small, petioles are shortened, and most lateral buds grow, producing short, intensely red shoots. The disease causes the plant to be exceptionally susceptible to freeze damage. 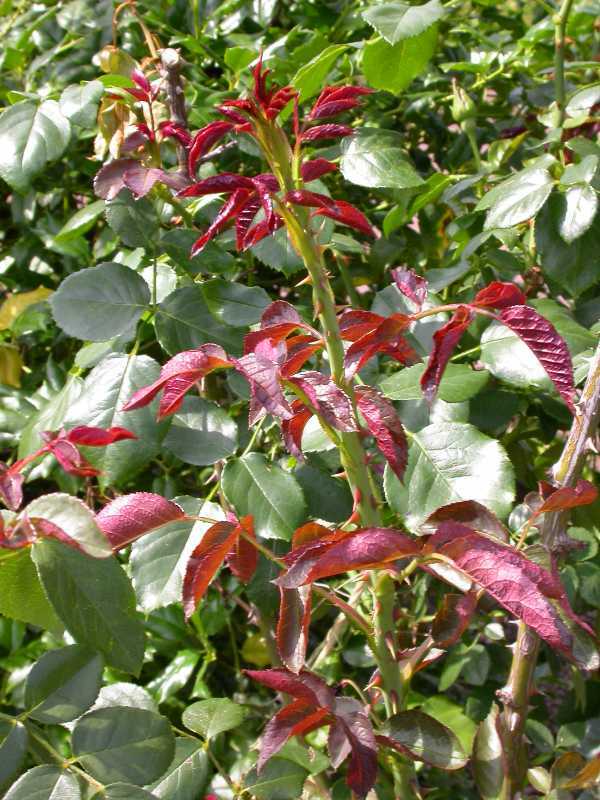 Symptoms on cultivated roses are typically less severe than on multiflora rose. 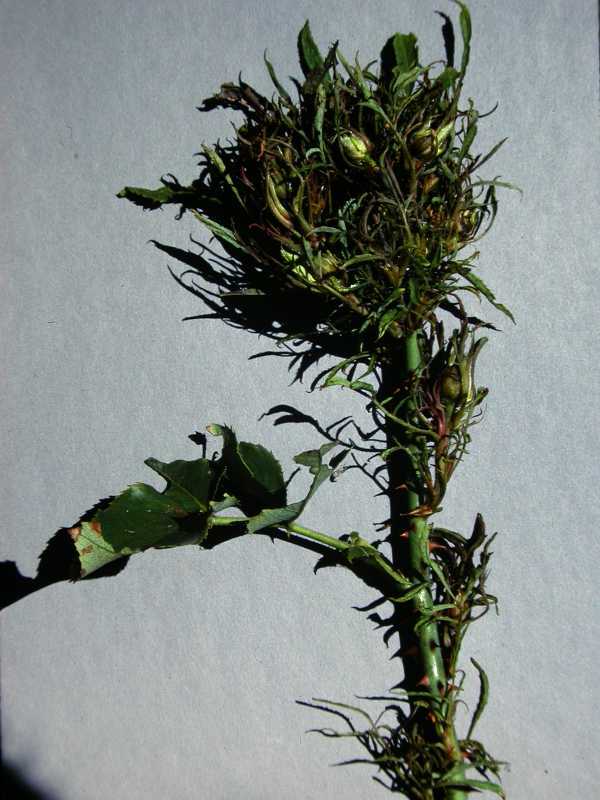 Cultivated roses show symptoms of thickened, succulent stems and a proliferation of thorns. Symptoms can mimic some forms of herbicide damage. The disease is transmitted by an eriophyid mite, a wingless mite that can travel passively in the wind as well as on contaminated clothing and equipment. The mites are most prevalent in the apex of the rose shoots where they feed and reproduce. Females overwinter under bark or on bud scales of living roses. The females move to newly developing shoots where they lay one egg a day for about 30 days. The young hatch in 3-4 days. They can reach adulthood in about a week depending upon temperatures. Multiple generations occur each year until fall when females seek overwintering sites. The mites are hampered by low humidity and can only survive about 8 hours without being on a host plant. Virus transmission occurs most readily between the months of May through mid-July when plants are making active growth. Symptoms from new infections usually start appearing in mid-July. In general, smaller plants go through the disease stages more quickly than larger plants. Small plants are usually killed in about 2 years, while a large plant may survive for five years in a deteriorated condition. 1. 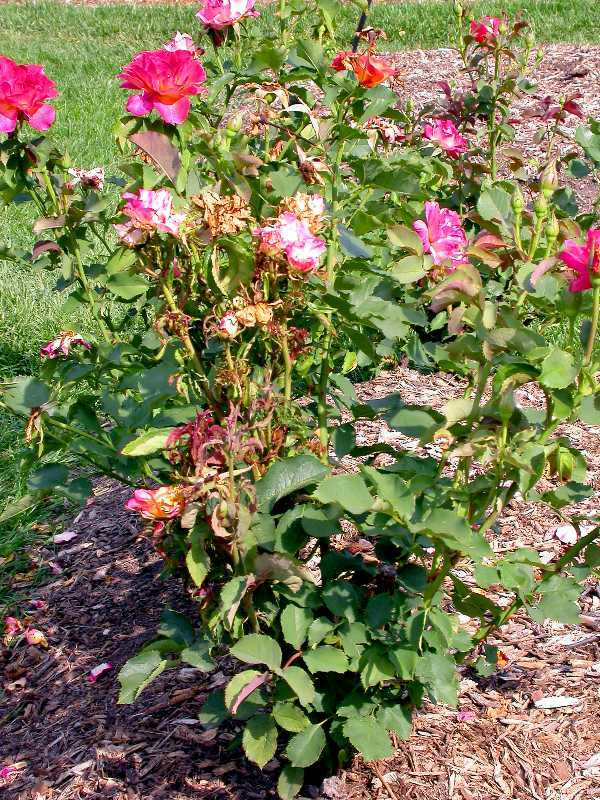 Remove ornamental roses with symptoms. The entire plant including the roots should be removed and destroyed by burning or placing in a plastic bag. Care must be taken when working with diseased plants as you can facilitate spread of the mites that spreads the disease. Bag the plant before removal, cut it at ground level and then dig out the plant’s roots. Soil need not be removed. Clean tools and put on fresh clothing before moving to a disease-free plant or area. 2. Plant ornamental roses as far away as possible from known stands of multiflora rose. 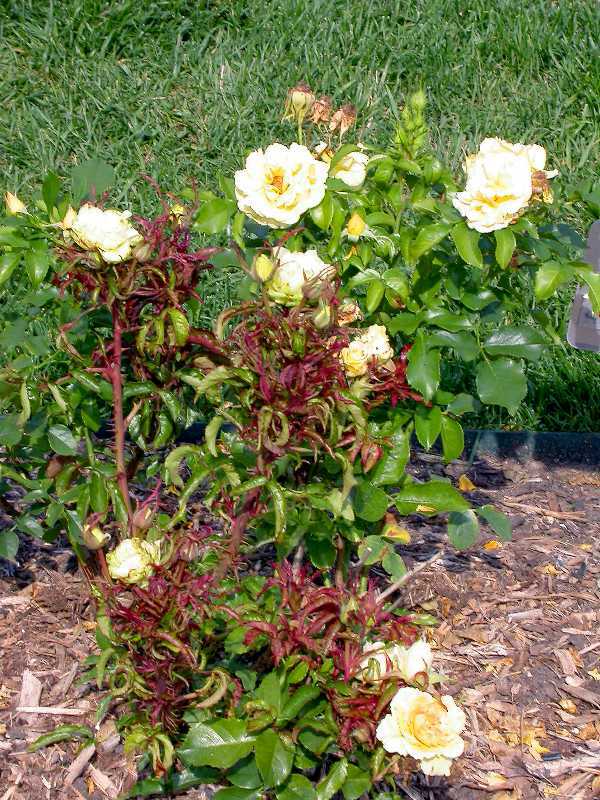 The general recommendation is maintain at least 300 feet between your roses and any stands of multiflora rose. Even greater distance is preferred especially if they are upwind of your desirable rose plants. 3. Control the disease by controlling the mite. Start mite control early by pruning your roses hard in late winter (back by 2/3) to remove as many overwintering mites as possible and then spray with horticultural oil to kill any remaining mites. Organic pesticides such as horticultural oils and insecticidal soap are recommended over other pesticides as these organic pesticides are less harmful to natural predators that feed on the problem mites. Apply weekly during the months of June and July paying particular attention to the new growing tips where the mites will congregate. Refrain from using leaf blowers around roses as they can spread mites. 4. Help to isolate your roses. Do not plant roses too close together. With extra space between the plants mite movement can be reduced. Also, consider interplanting roses with other ornamental plants. 5. 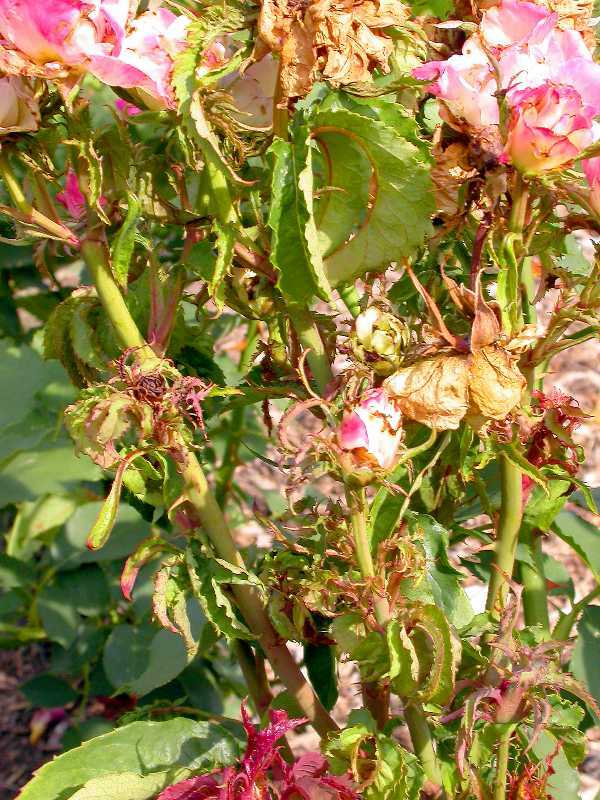 Using rose rosette disease as an IPM strategy. The multiflora rose is an exotic invasive species that is responsible for the degradation of millions of acres of farmland and recreational areas. Using the disease to control this invasive weed can cut costs and be considered environmentally friendly for reducing the amount of synthetic chemicals used. However, the disease also affects cultivated roses. One should be extremely cautious and good neighbor-minded when it comes to rose rosette disease. 6. Plant a resistant cultivar. Rose breeders have been working to develop new rose cultivars that are resistant to rose rosette. The first, 'Top Gun', is a shrub rose that is scheduled to be released in 2018. 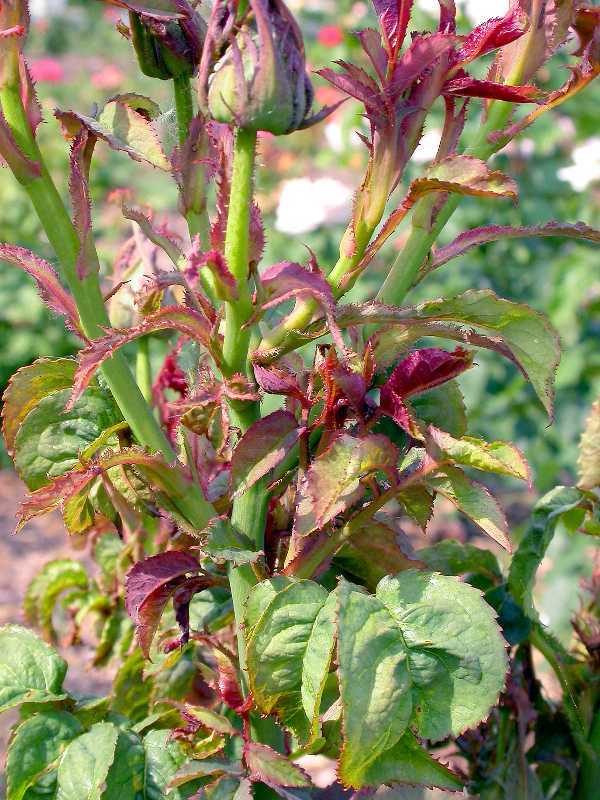 'Top Gun' is also reportedly resistant to most other common rose diseases. Others cultivars are planned to follow. All strategies are organic approaches. Of the insecticides mentioned in Strategy 3, consult the Organic Materials Review Institute (OMRI™) for appropriate products.